COMPLETE SET-This Pressure Cooker has all you need in making the best meals possible. With this 5 accessories, you can reheat multiple items at once and save time! It serves as the best gift idea for loved and dear ones. A perfect accessories set for your Instant Pot Pressure Cooker. PREMIUM QUALITY & SAFETY-Steamer Basket,Springform Pan,Steamer rack and Kitchen Tongs is food-grade 304 Stainless steel material, sturdy and durable,easy to clean,dishwasher safe.Egg bites mold is made from high quality food grade silicone and BPA free.The pressure cooker accessories are FDA certified and environmentally safe. HEALTHIER COOKING METHODS-The steamer basket is a healthy cooking choice because it helps retain more than 90% of the nutrients lost when either boiling or microwaving food.The steamer basket and Egg Steamer Rack can be used to steam veggies, seafood, eggs, meats, desserts, baby food and much more. Reheat your food without losing it's original flavor or nutrients so you can avoid using the microwave. The steamer basket is also a dish to contain fruits and vegetable. MULTIPURPOSE USAGE-Double layer non-stick coating eliminates the need for flouring the pan.Springform buckle provides easy release of baked goods.Great for endless recipes, including variety of cakes and cheesecakes.The egg bites mold can be used for ice-cubes, finger foods, jelly, pudding, mini-muffins, cupcakes, sauces, also can be used as child snack tray.Our kitchen tongs are cushioned, and have nonslip handles and thumb rests, and gently raised edges provide the perfect grip. 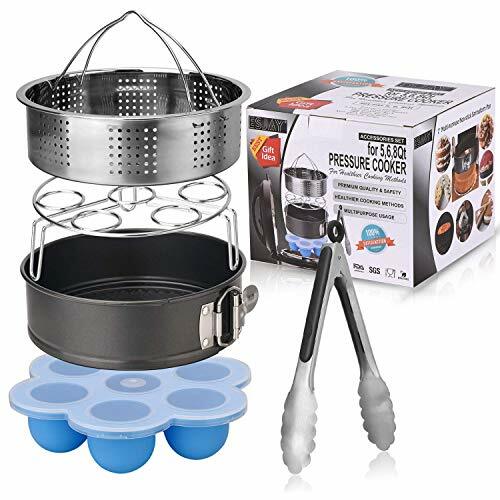 100% CUSTOMER SATISFACTION GUARANTEE-We are confident you'll love our Pressure Cooker Accessories.However, customer satisfaction is our top priority, so if you do not love our product, simply return it for a 100% refund within 30 days of purchase--no questions asked. Sending you a huge THANK YOU from all of us at Integrity Chef! If you have any questions about this product by Esjay, contact us by completing and submitting the form below. If you are looking for a specif part number, please include it with your message.